Matt made his exit from Montevideo on Thursday night. The days coming up to his departure were full of seeing people and fun activities. Saturday night a couple of friends were gracious enough to host a “Despedida” (going away party) for Matt at someone’s house. There were drinks, food, and good conversations. There was also some gift giving and some challenges to drink beer out of a frisbee. For those of you that don’t know, it is possible to fit an entire pitcher of beer within a frisbee. Many people don’t believe this and do stupid things to prove that it is false (like trying to drink an entire frisbee full of beer within 20 seconds… good luck with that one). 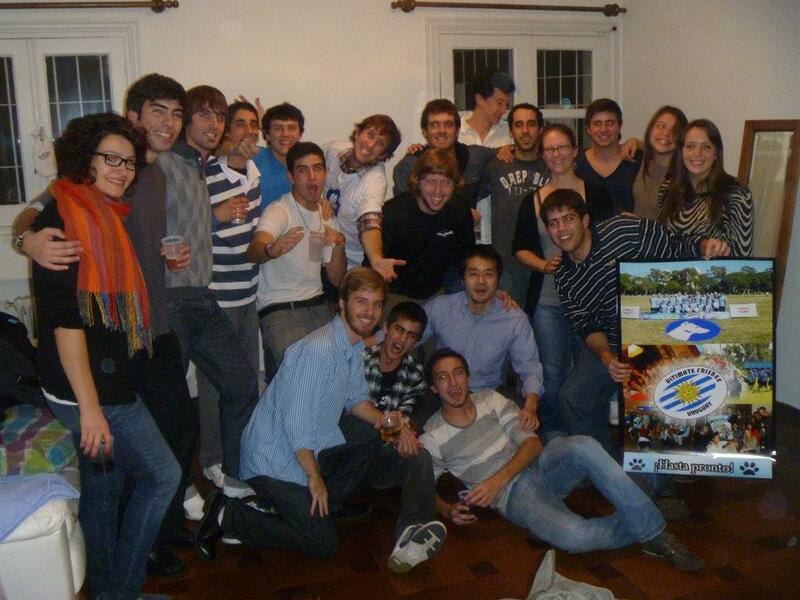 The majority of the ultimate team here in Uruguay. They made Matt a poster collage of photos from his time in Montevideo. 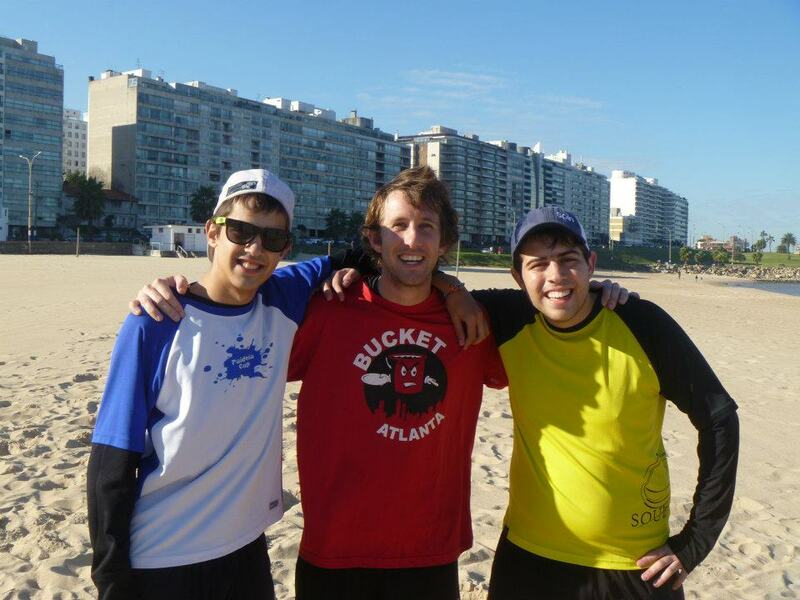 Sunday was a great day of frisbee out at the beach. After finishing up, Matt did a great job practicing his minimalist lifestyle by giving away a bunch of his ultimate jerseys to the players here in Montevideo. The people here will greatly appreciate nice jerseys, and Matt has about a billion of them. At this point, Juanma can dress completely in clothes given to him by Matt (including cleats). It’s like a South American version of Matt! Juanma, Matt, and Carlos at the beach. Tuesday was dinner with our good friend Paco at La Lupita. We have been here once before, and yes, the margaritas were just as potent as the first time! Wednesday, Matt’s last night in town, we went to a parilla (grill) so that Matt could eat one last steak. Chandro was gracious enough to come with us. The restaurant was great! Chandro had a traditional asado, Matt had a cut of steak, and Asa and I split some chicken and veggie skewers. The boys ordered caipirinha’s, a Brazilian cocktail. It is made from a Brazilian liquor called cachaça, which is similar to rum but made from cane sugar. Thursday Matt and I took a trip downtown with the quest of finding gifts for his family that they would actually use and enjoy. The day was a little gloomy and once it actually started to rain all the vendors quickly packed up their wares. Matt was left with only the small magnet he had purchased. It’s probably for the best because his family probably didn’t really want bracelets or little wire figurines anyway. I imagine they’ll be happy enough just to see him again! Matt managed to pack everything up, including the 5 bottles of grapamiel (a local liquor that I’ll talk about in another post) he had saved to take back to the states. He headed to the airport with plenty of time, as they had delayed the flight by almost an hour. Unknown if the delay was caused by weather here in Montevideo (it was rainy) or by weather in Miami (from TS Debby). Based on our intelligence, Matt made it to Las Vegas for his sister’s wedding, but only after being detained by US customs for about 45 minutes in Miami. They apparently found his story about quitting his job and moving to Uruguay a little fishy. He missed his direct flight to Vegas and had to be re-routed through Los Angeles. Hopefully he’ll get on the blog and tell everyone about his experience. So what are we doing now? Well Asa and I are going to enjoy our last four weeks in Montevideo. We have already taken over Matt’s room. Just kidding! We don’t really have a bucket list of things to do before we leave. We’ve already done most of the things to do in the city and the ones that we haven’t done don’t sound that interesting. So I think we’re just going to enjoy immersing ourselves in the Montevideo culture for another couple weeks and call it good! Matt is in Vegas for about a week and then he is headed to the Philippines for a two week internet business program being held at some resort right on the beach. Poor Matt! He’ll be there two weeks beforehand and probably two weeks after. Beyond that, it’s anyone’s guess (including himself) what he’ll do. I tell you all this so that you won’t wonder why Matt fell off the grid for so long, but we’ll get him to come back to the blog when he’s got some time! We wish Matt good luck in his travels and know we’ll see him sometime in the future! This entry was posted in Adjusting, Living Conditions, Minimalism and tagged Asado, beach ultimate, bracelets, cachaça, caipirinha, customs, grapamiel, Las Vegas, Matt, mexican, Parilla, party, Philippines by mlwattsupp. Bookmark the permalink. Yep, a bit sad. Hopefully he’ll have a good time on his continuing adventures!